In the time I’ve been writing and producing the Sequential Sunday column I’ve always chosen as my subject matter a certain creator, publishing company, or gallery event. 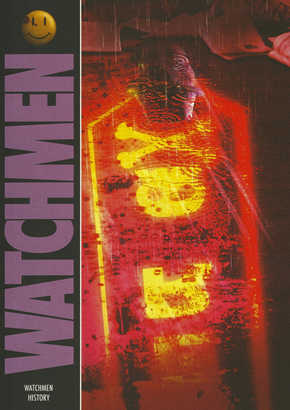 I’m going to go against my own grain this time and choose (of all things) a promotional item, namely the British press kit produced to herald what was, at the time, the upcoming Watchmen movie’s release. 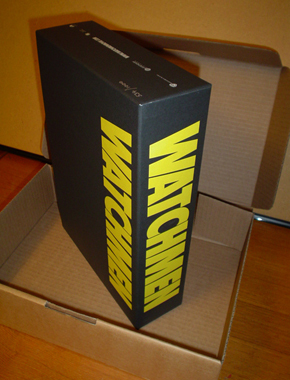 What looks at first like a plain brown box actually conceals this behemoth of a press kit. Now, movie promo items are usually a pretty lame affair consisting mostly of boring posters, logo-adorned paperweights, and t-shirts that you’ll only be wearing the next time the house needs painting. 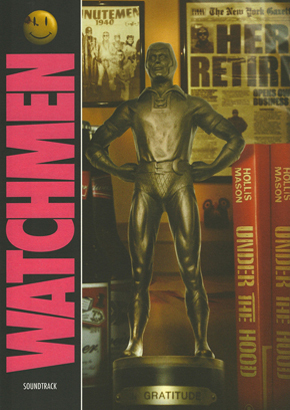 This Watchmen kit, however, is so lavishly over the top in both content and the quality of the materials presented that it becomes a mandatory possession for fans of both the movie and the original, unbeatable DC mini-series. Though this press kit (of which only 1,000 numbered pieces were created) is well over a year old I only found out about it relatively recently. This is due to the fact that in the months leading up to the film’s release I avoided all info on it like the Black Freighter itself, for fear it would give away too much of the film’s visuals (if the movie was good) or help sour my grapes further if those behind its creation royally blew it (and it completely sucked.) Thankfully, I enjoyed the movie quite a bit and feel the filmmakers did a much more than serviceable job with what is undeniably very difficult material to adapt to another medium. 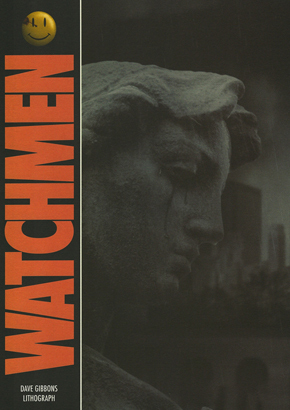 There are 12 folders contained within the slipcase, the fronts of which photographically recreate the 12 covers of the original mini-series.Each folder houses a separate item(s) and the best one to start with here is the first of course, which contains a single page introduction by Watchmen director Zack Snyder. 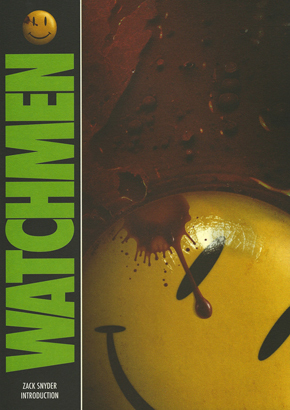 The third folder (we’ll get to the second one later in order to save the best for last) gives us a very detailed Watchmen timeline in the form of a 10 X 26 in. poster. 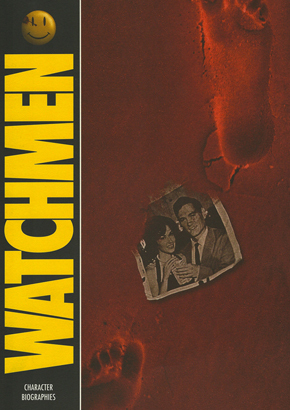 The fourth contains 7 awesome character biographies presented as police documents written after the anti-hero Keene Act was passed in the 1970’s.Our fifth folder has a four page Watchmen history that explains why this comic is as important and highly regarded as it is. 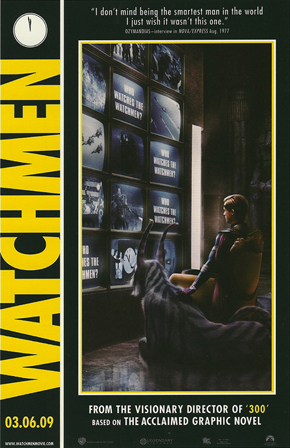 The sixth holds a cd-rom of production notes concerning cast, crew, and the making of Watchmen. 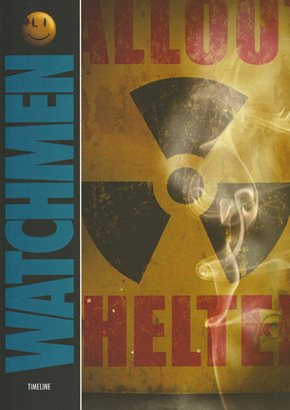 Moving on to the seventh folder we get a dvd of the 11 webisodes that appeared on the official Watchmen site periodically during the film’s production.The eight houses the complete film soundtrack (the pop & rock songs used, not the orchestral score.) 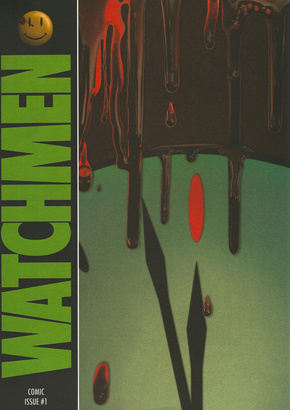 In the ninth folder we get seven incredible 8 X 5 1/2 cards that reproduce imagery from promotional posters. The tenth has a set of seven buttons (or “badges” as they’re called by our friends from across the pond. 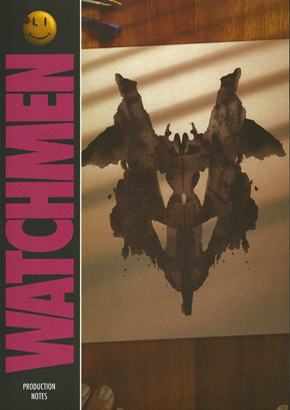 )In folder eleven is a 13 X 20 reproduction of the popular teaser poster. 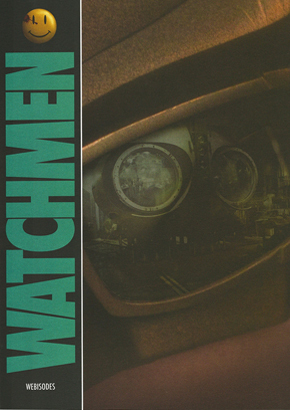 Finally, in folder twelve is a reproduction of the first issue of the Watchmen comic. But wait! What of the second folder that I so willingly passed up in order to save the best for last? 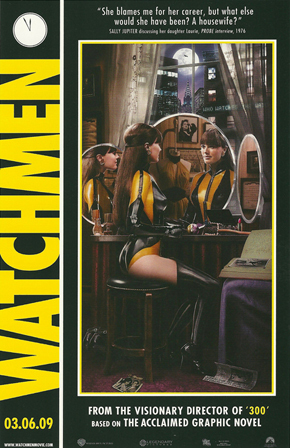 If there are any complainers out there who did not like the film adaptation of the comic series, who are not impressed with everything we’ve seen so far, and wonder why this press kit is mandatory for all Watchmen fans? This is why. 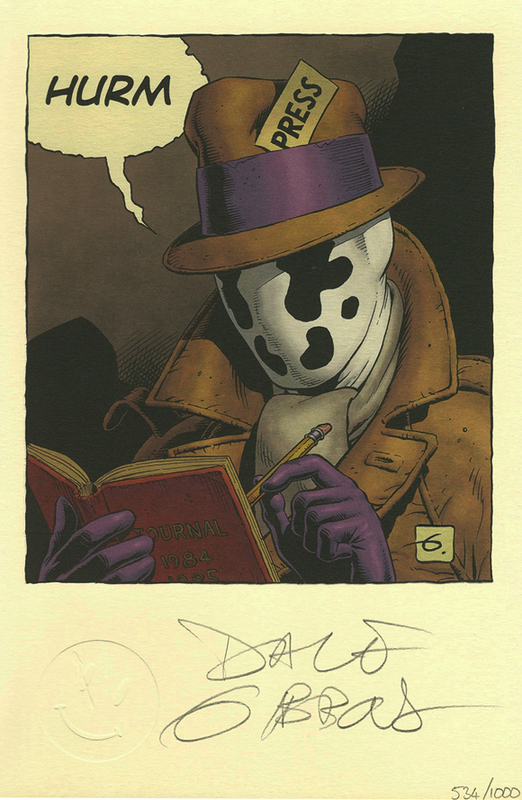 An 8 X 7 lithograph of Rorschach by Dave Gibbons on beautiful cream colored paper, signed & numbered (to 1,000 just like the kit), with an embossed smiley face in the lower left hand corner. This image was created specifically for this, and is available nowhere else. Whew! 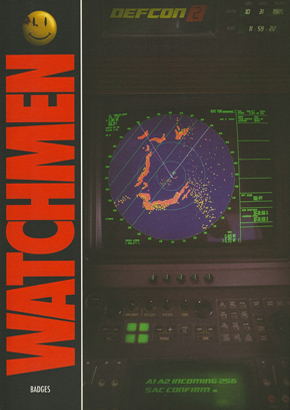 That’s a lot of Watchguys and gals material to go through. This is a pretty rare find, even only a year later, but if you do see one, don’t hesitate. 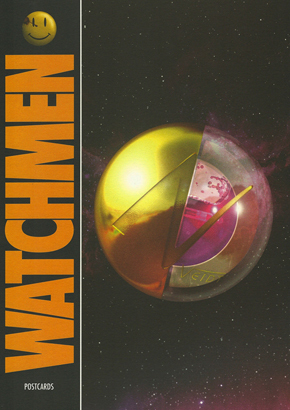 I’m quite sure the only reason this promotional item is so loaded is because the filmmakers knew they were being entrusted with something special and wanted those unfamiliar with Watchmen (those being the press) to know this was to be very different and very special compared to all super hero films that have come before. I can say that with this British press kit I think they proved their point quite well. 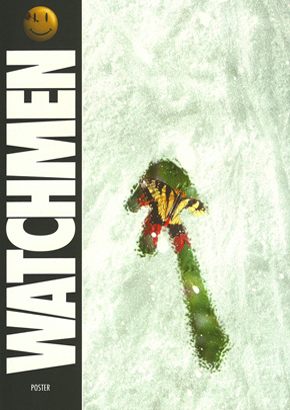 Why, I haven’t been this excited since I found a batch of tasty Watchmen cupcakes.